I buy these boots all the time. Get fit and comfortable. After a while i need to get insoles for the side of my boots. If I didn't have to i would give them 5 stars. I have been wearing these 8049 Carolina boots all day, nearly every day for many years. This is probably my 10th pair. I won't buy anything else. Yes. Only issue is i was looking for the memory/ pillow insole. Got the cushion insole i ordered and it is fine. My boyfriend likes his boots. He says they r very well made and very comfortable. These shoes have been good for my feet for many years. I have been a truck driver for 30 years and have been through many shoes, bu I will never buy any other kind of shoes. My feet and legs feel so much better. I would recomond these shoes to any man that does hard labor. Great boot! As a construction worker, needed a good boot for working in mud and concrete. I am a Union Ironworker in Erie, PA. These are the only boots I wear, they are perfect for my line of work. They are very comfortable right out of the box, they last a long time, and the price is right. Also, ordering them from Shoeline.com was very easy and they were delivered to my door in just a few days. Good deal! 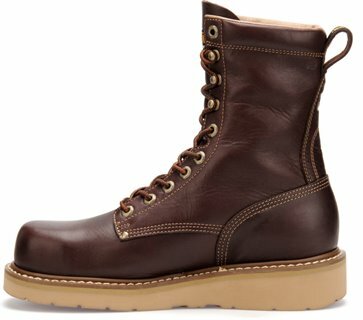 I'm a union Ironworker in Newark n.j. , I've tried all different types of boots. If your gonna be on your feet all day, this by far is the most comfortable. Love this boot .Bought for my brother and he says it is the most comfortable boot he has worn will be buying more in the future . Great shoe for a welder shoe laces don't get burned as easy as some do. I have wore this boot forever. Everyday,sometimes all weekend. I was told it was no longer made but found it here. Thank you for that. I want to know y u send me a discount coupon and it wont apply to the boots I always purchase? Ordering from shoeline was a piece of cake. The boots were perfect and came in 2 days! Awesome! Great support on lower back and knees!Didn't take long to break in for comfort! These Boots ar great they fit well and very comfortable to stand or walk it great ankle support too.The leather is the thickest Iv ever seen on a boot like this and will were great. I gave mine 3 coats of Mink oil and really help them soften up! i'v been a framer/carpenter in the pacific northwest for well over 30 years and have been wearing the same Carolina boot since i can remember. they have always held up very well and the fit is always consistent and very comfortable , thank you. Hardest and thickest leather. Very uncomfortable in the tonge, ankle, and calf area. Although the American made ca 1007 boot doesn't have the soft pillow cushion...and this Vietnam else made boot does...i will in the future keep with the American made Carolina product. I was a little nevous about ordering shoes from the internet, but shoeline service is very good, fast and efficient. Happy with thier service. For me this is the longest lasting shoe I have ever had.Working in landscape industry I haven't found a work shoe that will last as long as the carolina. As with any leather boot it’’s a little stiff to begin with. I applied some neatsfoot oil to soften things a bit. The back of the boot needs more softening the triple layers of leather tended to remain pretty stiff. All in all a good fit just need to break them in some more. Always had good luck with Carolina boots. It took me about a week to break them in to my liking. Very comfortable now. Have worn the Carolina Brand work boots for many years. I am a construction electrician and I put alot of time standingand walking on concretethus the cushion soles really help. The boots stand up weel to the rough and tumble world of construction work. Great boot. Comfortable long wearing. This is a good quality boot that I have worn for years Also I would like to say that Shoeline is the easiest company that I’’ve ever made purchases from I placed the order which was shipped the next day received an email with tracking numbers paid no shipping charges--you couldn’’t ask for any better service Thank you. The only pair of boot these feet will step in.. They are comfortable right out of the box..This is my 8th or ninth pair once you try these you will be sold. I have a very wide footOK with a 3E4E idealBought this boot in a 2Ethe broad toe has exceeded my expectations.I find that the 2E with the broad toe fits me well enough that can use this Boot and not be uncomfortable to the degree that they are unwearable.In additionthis is the most comfortable out of the box Boot I have ever purchased. The only work shoe I will ever buy and I tried them all. I have bought this same boot 5 years ago and still have them to work in. The boot looks and wears great with great protection and comfort. Do try them out. On the first day of use my husband wore them on the job for fourteen hours straight Usuallywith a new pair of boots he’’ll change into an old pair halfway thu the day. The cushioning is great.